Situated on the northern most end, it displays images of Buddha, Vajrapani, Bodhisattva Padamapani holding stem of full bloomed lotus, Nilakantha Lokeshvara with a cup of poison in hands and Maitraya, the future Buddha. The most notable sculpture of Sarnath School of Art in this museum is undoubtedly the image of preaching Buddha dated to Gupta period. This image is remarkable example of the form of compassionate one in its spirituality and inner- bliss. The wheel (dharmachakra) occupies the central position on the pedestal. Figure of deer are placed on either side of wheel denoting the place as deer park. The figures of five disciples to whom Buddha preached first sermon are depicted along with a lady and child on the lower part of the image. 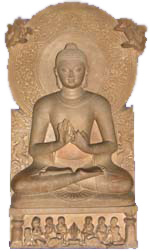 Other images of seated and standing Buddha in different postures displayed in this gallery are also very remarkable examples of Sarnath School of art. 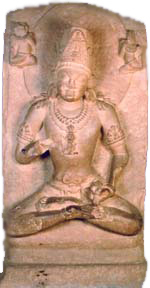 Gupta, c. 5th cent. C.E.